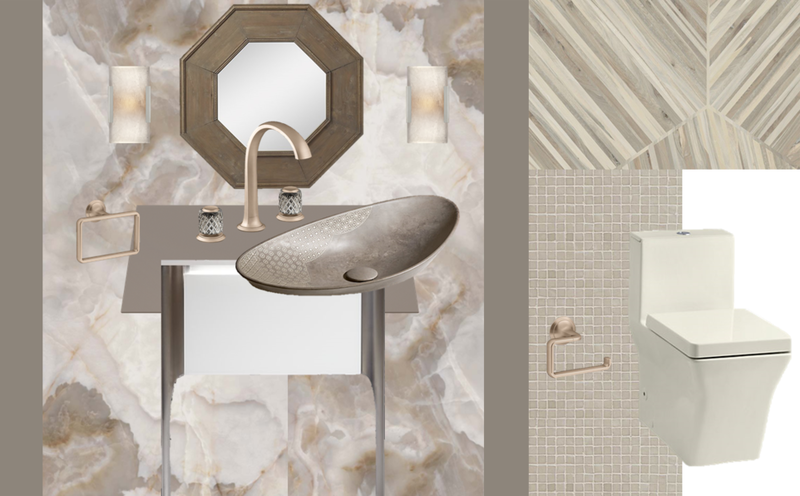 I'm calling this powder room concept board transnatural contemporary, but let me explain before you hit that "x" and call me crazy - it's filled with products and trends that need some explaining. first of all: "transnatural contemporary," a blend of bonafide contemporary and diehard transitional products, dictated by natural materials utilized in an atypical contemporary way with artisan touches. this is my newest discovery, and what I'm deeming the delight of design's product of 2018. from a brand named florim, this is a giant, millimeters-thin slab of porcelain! these slabs are 63x126" and they are incredible. florim offers so many designs, surface treatments, and formats. emphasis on formats! blending an alabaster print on a slab of 6mm porcelain - is there anything more transnatural contemporary? additionally, the prints have such a high dpi and are virtually impossible to identify as porcelain. if you have the opportunity, find a showroom and go see this stuff for yourself. the one caveat is price: one of these 63x126 slabs will run you around $6k+. trough sinks are huge (pun intended) right now, and this trough from kohler has just the transnatural appeal needed to warm up this concept. as my previous posts not-so-subtly suggest, I'm usually not one for natural-material sinks. however, this particular sink has one of the textures/sealants I've ever seen or felt on a natural cast product and I am completely confident in its longevity and durability. it's modern in shape but has a natural appeal in material. the scribing is beautiful and adds a transitional, artisan touch. the through-body color contrasts so beautifully against a busier background. the balletto from robern. I have mixed feelings about robern for a multitude of reasons, but the balletto has beautiful and practical purposes in specific spaces. brushed nickel legs add a cool touch to the primarily warm space, but compliment the blush bronze of the faucet. the ivory/off-white glass face pops and boosts the contemporary feel. one of my favorite things about robern is their "nightlight" features, (robern in general is known for their lighting) and really sheds a contemporary light on this space (lol). most people cringe when they hear about these handles - st. louis crystal, carved by masters with no less than 10 years of mastery in the field. "it's so unnecessary, why not just plastic or something," consumers bemoan. there are some applications where luxury faucetry is needed as the jewelry piece of a room, and this is it. those handles need to be seen in person, believe me. the blush bronze of the faucet is amazing as well. engineered to be similar to a brushed bronze, champagne bronze, etc., it's similar to most standard industry brushed bronzes, but kallista managed to tone down the reddish hues. in a mixed-metal setting such as this one, it slays with the brushed nickel accents. a large waterfall spout and seamless escutcheon transitions make this the ideal transitional, timeless faucet. the kohler reve. a very modern, streamlined toilet in a warm biscuit makes the contemporary vibes much easier to swallow. kauri diagonal in beige porcelain by artistic tile. keeps the color palette going, utilizes contemporary materials, and straight up looks dope. it's a well known fact that my most very favorite designer in the whole universe is the design queen and maven, kelly wearstler. when I came across these sconces at circa lighting, I was sold. real alabaster on a porcelain alabaster - it's so perfect for a transnatural contemporary space. upon taking a closer look, I learned these are KELLY sconces. flipped out. the maven does it again. slay, sister. (life hack head over to circa lighting for some incredible product). restoration hardware. it's a transnatural room. rh had to be involved. DEKTON. this is a newish product that is similar to quartz; man-made, but instead of using quartz as a binder, dekton uses a micro-ground porcelain, making it even more durable. finishes are a bit more limited since it's still coming-to-market, but it's a product you'll soon see all. over. I am in love with it almost as much as I am in love with florim. florim mosaic. a little lux. non-rectified edges of a mini squares mosaic adds a little glam and a little artisan touch. perfectly complimenting the lines of the reve. and that's all we've got! what are your thoughts on any of these products? have you used florim (and if so, do you LOVE it as much as me, or am I really just going crazy?). comment! can't wait to hear from you!